Carnival Corporation has officially opened the third berth at Cozumel Pier, Mexico, which will facilitate an increased number of visits its 10 global brands make to the destination. The Corporation invested in excess of $20 million (approximately £13 million) constructing the third berth at Puerta Maya which will allow three ships to be moored at the terminal at the same time. To mark the launch Carnival Breeze, Carnival Freedom and Carnival Triumph became the first trio of ships to use the new facilities. With 3.3 million cruise guests annually, Cozumel is the busiest cruise destination in the Caribbean. 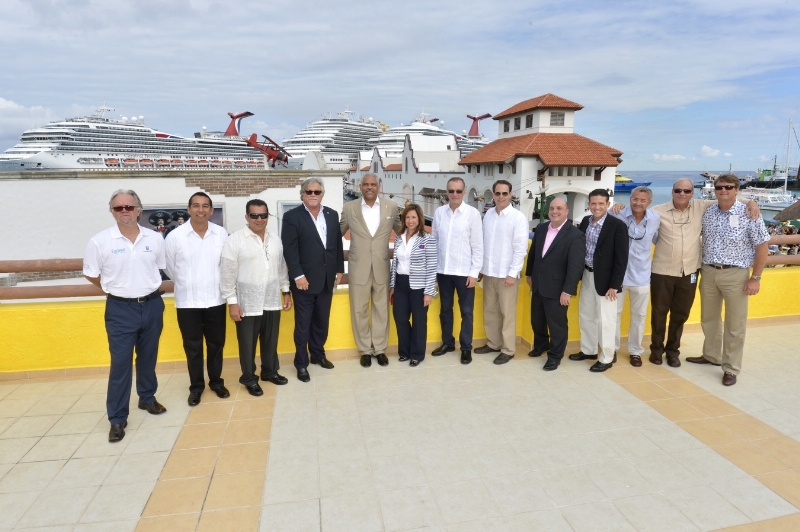 The pier will accommodate any ship across Carnival Corporation’s 10 brands, including its next-generation ships. Plans for the third berth were drawn up in 2005 and construction work started in May 2014. The existing two-berth pier was re-opened in October 2008, following an extensive $50 million (approximately £32.5 million) reconstruction to repair the damage caused by Hurricane Wilma in 2005 which included destruction of the original pier. All three piers have been constructed to withstand a category five hurricane. Puerta Maya is one of three cruise terminals in Cozumel and is owned by Carnival Corporation. Carnival Corporation also operates five additional global ports, including the newly opened Amber Cove in Dominican Republic; Palacruceros in Barcelona, Spain; Grand Turk Cruise Centre in Turks and Caicos Islands; Mahogany Bay in Roatan, Honduras; and Long Beach in California. The company also operates two private island destinations in the Caribbean, Princess Cays and Half Moon Cay. In other news Carnival Cruise Line recently announced its new Fly2Fun air programme that is designed to provide guests with maximum value, choice and convenience when making their air arrangements in conjunction with their cruise. Guests can specify their preferred air carrier, departure point, specific flight schedule, and class of seat (economy, premium economy or business/first class). Flights can also be tailored for those wishing to extend their holiday with a pre- or post-cruise hotel stay. Fly2Fun also includes Flight Protection, ensuring that guests will be flown to the next port of call to begin their cruise should they miss their departure due to airline mechanical or weather-related issues. Carnival will cover air, hotel, transportation and meal costs for guests to meet the ship in the next port of call. Fly2Fun must be booked via phone. Once a cruise reservation is in place, guests can call 0845 351 0556 to make the air reservation.